Today’s news is full of articles about the buying power and habits of the “millennials”, which has an estimated population of 78 million. This Women’s Wednesday is part of a multi-part series we are exploring about women buyers within this segment. Of millennial buyers, 53% are female. Understanding the nuances of selling to this new generation of women can put your dealership in a position to leverage the newest car buyers and truly increase your market share in today’s ever competitive industry. Our latest study tracked 620 reviewers and sheds light on the similarities and differences between millennial and non-millennial women that will help you create age-specific sales techniques. Both millennial and non-millennial women ranked their satisfaction level with dealerships as very high. 1. While “excited/excitement” is the #1 emotion the buyer felt while shopping for a car, millennials report “relaxed” as being number two, versus “apprehensive” for non-millennials. Why it Matters and How to Leverage: The newest generation of women reports they are more relaxed and confident when buying a car than previous generations. Why? According to a study by Ameriprise Financial (June 2014), millennial women are more in control of their finances and enjoy making these decisions. 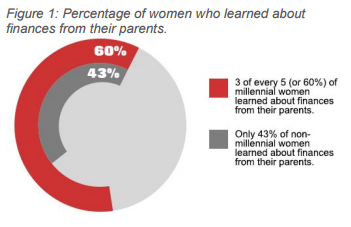 Six in ten millennial women (vs. 43% of non-millenial women) reported they learned about finances from their parents. Additionally, younger women are more comfortable using technology to arm themselves with the information they need to make car buying decisions. Astute sales advisors who understand and respect this confidence will quickly gain the trust of their potential car buyer. A good sales approach is to ask questions, respond truthfully, and guide car shoppers through the remaining information needed to make a decision. Above all, assume these women are smart, and have spent a lot of time learning about what they want. While they may have less experience buying cars than older generations, they have a wealth of information at their fingertips that has not been readily available in the past. They are prepared and fully capable of accessing that information while inside your dealership. 2. “Trustworthiness” and “respect” are ranked #1 and #2 for millennials’ reason to buy from a sales advisor. “Understanding” replaces “knowledgeable” as #3. Millennials visit slightly more dealerships to look for a car. Why it Matters and How to Leverage: Millennial women hold trust and respect as the top qualities they insist on for a sales advisor. They expect their sales advisor to understand them and what they want in a new car. Many millennials are first time buyers and combined with the knowledge and confidence described above, want to feel they are making a comfortable choice. Trust and respect comes from realizing millennial women have done their homework about what is available to them. Sales advisors will benefit from listening carefully to what their millennial shopper is saying and provide honest answers to her questions. A prepared buyer doesn’t need help with all of the decisions. Learning to perceive where the grey areas are can help accelerate a sales decision. Be there to help, not coerce. And listen, don’t lead. Get The Full Millennial Women Buyers Report Now!